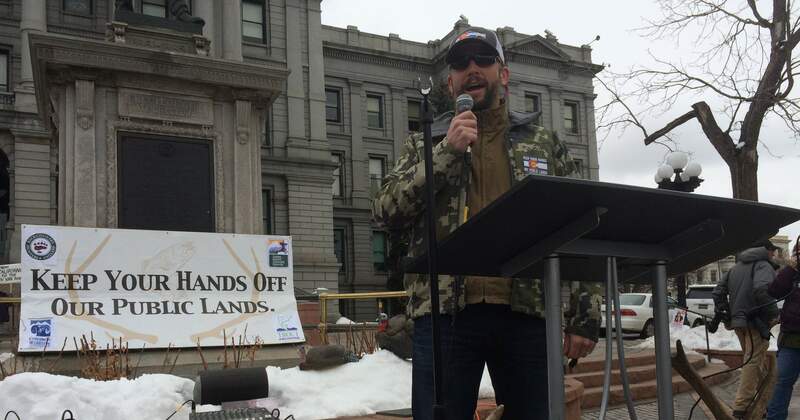 Anglers and hunters held a rally Wednesday at the Colorado Capitol calling on sportsmen to oppose efforts to transfer federal public lands over to state control. 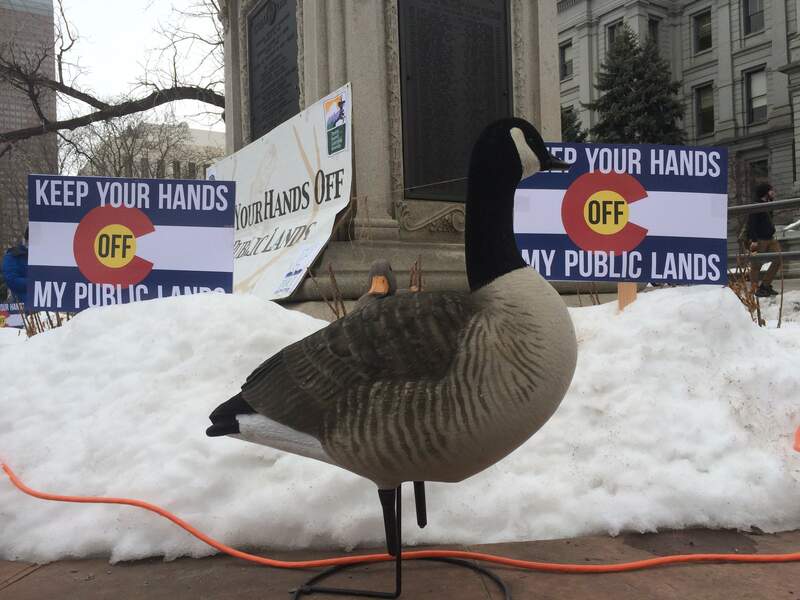 Lawn ornaments of geese stood in front of signs urging state lawmakers to “keep your hands off my public lands” at a rally Wednesday at the Colorado Capitol attended by sportsmen from around the state. 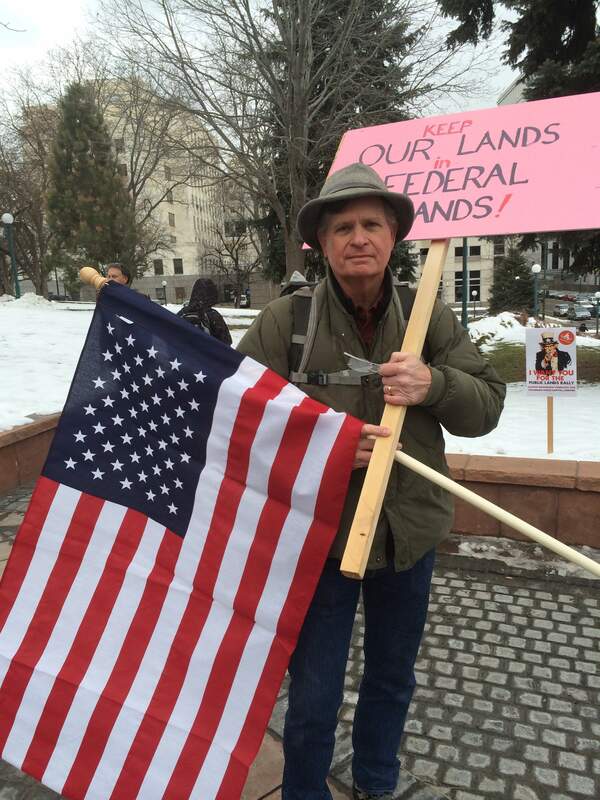 Chris Madson, a sportsman from Wyoming, traveled to Denver on Wednesday for a rally at the Colorado Capitol urging state lawmakers not to transfer federal public lands over to the state’s authority. The gathering of sportsmen from around the state – and even from neighboring states such as Wyoming – served as a warning to state lawmakers not to advance efforts that would transfer control of federal lands over to the state. “For hunters and anglers, our public lands are the backbone of our passions, and it’s on public lands that we hunt and fish,” said Ty Churchwell, a Durango fisherman and Backcountry Coordinator for Colorado Trout Unlimited’s Sportsmen’s Conservation Project. “These public lands are our birthright, they’re our heritage, and they’re shared and owned by all Americans,” he said. 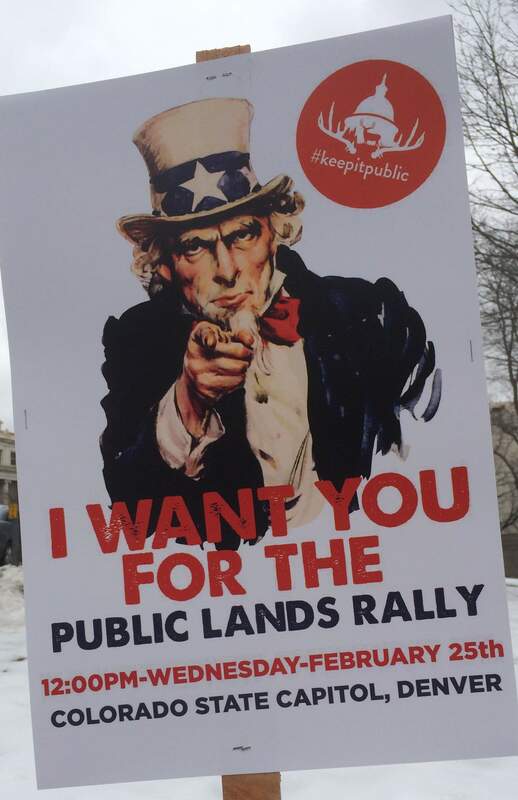 State lawmakers in the past attempted to pass legislation that would have required the federal government to turn over millions of acres of federal public land to the state. Another legislative effort included trying to force the federal government to sell federal lands to private buyers or face a property-tax bill from the state. This year, there have been no bills so far seeking to transfer federal lands over to the state outright. But one measure, Senate Bill 39, would allow Colorado to have some legislative and taxing authority over federal public lands. The federal government currently holds exclusive authority over its public land. The bill would allow Colorado to exercise authority along with the federal government. The bill’s sponsor, Sen. Kent Lambert, R-Colorado Springs, said his aim simply is to provide Colorado with some flexibility when dealing with natural disasters on federal lands, such as responding to wildfires. “My first intent is allowing the state, and especially county sheriff staffs, a place at the table for combined emergency planning and response, especially for rapid containment of forest fires,” Lambert said. Lambert called the current system a “bureaucratic separation” that doesn’t allow for states to work with the federal government. But sportsmen and conservationists are worried about chipping away at the federal government’s authority. They suggest that it would be extremely costly for the state to take control of federal lands. A mismanagement of the lands acquired by the state could cut into the economic benefits Colorado gains from hunting, fishing and other outdoor tourism activities. Outdoor recreation contributes more than $34.5 billion in annual economic activity and creates 313,000 jobs in Colorado, according to a 2014 report by Colorado Parks and Wildlife. Nationally, the number climbs to $646 billion. “We want to stand strong for the wild country and protect and safeguard that birthright of those unborn generations,” said John Gale, conservation director for Backcountry Hunters and Anglers. Churchwell rejected claims that the state could do a better job than the feds at managing public lands.